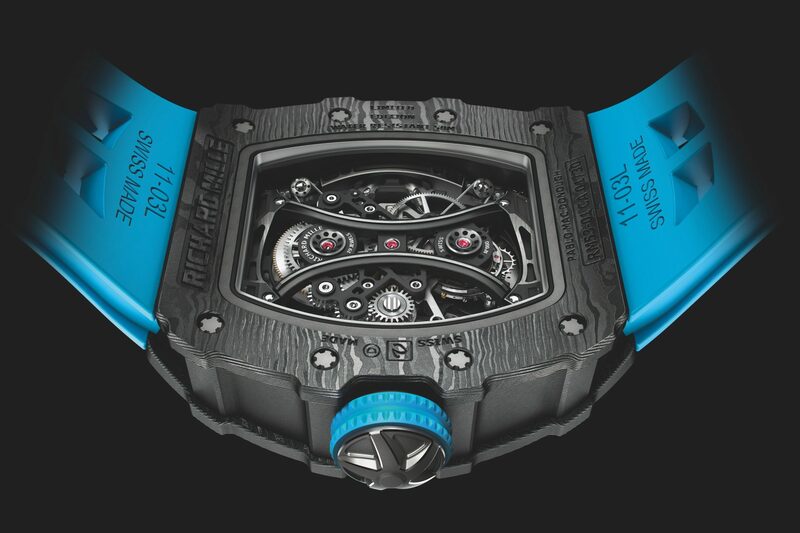 True to form, Richard Mille opened this year’s SIHH with a limited edition release that ticked all of the brand’s signature boxes. High concept watchmaking? Check. Inspiration from the world of professional sports? Check. Stupefying price tag? Double check. Designed with creative input from Argentinian polo player Pablo McDonough, the RM 53-01 is Mille’s second release to be inspired by the decidedly ancient equestrian sport. McDonough previously collaborated with Mille on the RM 053; and while that watch shared thematic similarities with the brand’s latest release, the two could not be more distinct in terms of architecture and visual impact. Whereas the RM 053 bordered on steampunk — featuring a disproportionately small time display (made up of two intersecting cutouts) and dial pitched at 30 degrees — the new 53-01 works closely within the confines of Mille’s more traditional design language, built around a tonneau case and openworked movement. The latter is particularly impressive as it’s visibly suspended in the case’s midsection by way of an elaborate cable-and-pulley system, all while managing to incorporate a large tourbillon at the 6 o’clock position. The RM 53-01 is imbued with hitherto unrivalled protective qualities thanks to a proprietary crystal glass feature (designed in tandem with Stettler). The designers at Mille have worked hard to leverage McDonough’s practical insight as a professional polo player into this new release. From the very beginning, it was pivotal that the 53-01 be tough-as-nails: capable of (and indeed, well suited) to wear on the field during competitive matches. Consequently, as with numerous other Mille releases, the 53-01 makes use of a carbon TPT casing: a composite material developed by the manufacture that is uniquely resistant to shocks and microfractures. The need for superior toughness and protection had to be harmonised with Mille’s internal practice of preserving maximum on-wrist visibility. To achieve both objectives, the manufacture worked closely with Stettler — a sapphire glass manufacturer that has supplied horological marques since 1881. Turns out, to address the risks inherent to a contact sport like polo, the solution had to be proprietary. Mille and Stettler settled on a unique design feature: two individual layers of sapphire, joined together using polyvinyl, compose the “glass” used in the 53-01 dial. The polyvinyl’s adhesive properties ensure that if the sapphire glass is ever struck — for instance, by a mallet — it will crack rather than shatter. The result is display glass that possesses almost unrivalled toughness without sacrificing an iota of visibility. On both the dial side and caseback, the RM 53-01’s distinctive suspended movement is visible. Once under the proverbial hood, the 53-01’s most impressive feature is its cable suspension system. Mille have experimented with this feature for a number of years (their first suspended movement was in fact developed for the RM 27-01 co-designed by Rafael Nadal) although the current iteration is by far its most impressive. This watch’s calibre is suspended around an architecture of two separate baseplates: the primary and larger plate is mounted directly to the case and supports four tensioners; while a second “central” plate incorporates the movement itself in addition to a high efficiency winding system. A series of ten pulleys and braided steel cables interconnect the two baseplates, with the overall effect being reminiscent of some sort of mechanical web. Naturally, all of these high-execution details suggest the quintessential Mille price tag; and the RM 53-01 is no exception. For the 30 diehard collectors who can afford it, it’ll likely be a point of pride that provides no shortage of conversation. 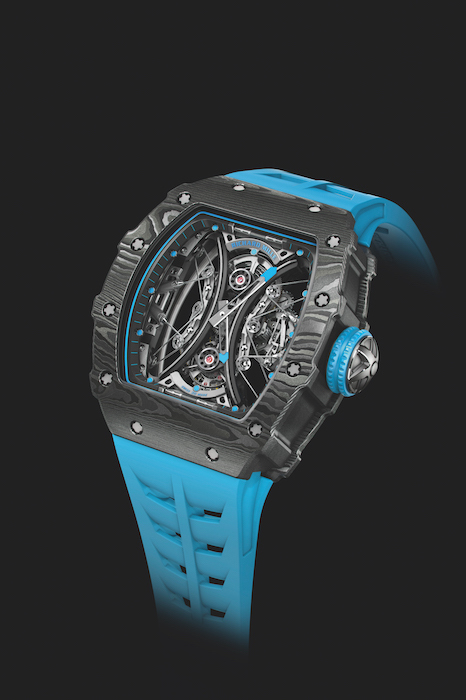 The RM 53-01 is available in a limited run of 30 pieces, priced at US$900,000. 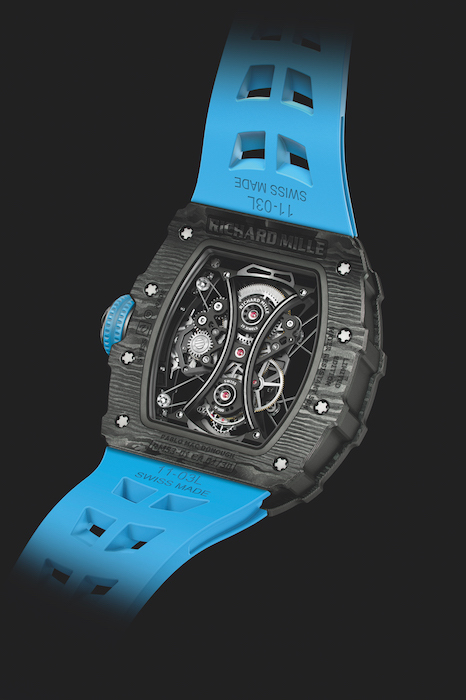 For more information, visit Richard Mille.